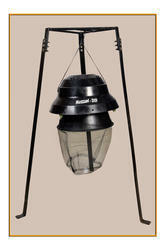 Prominent & Leading Manufacturer from Pune, we offer mosquito killing machine. Our organization has successfully expanded its business in market owing to the offered elevated quality array of Mosquito Killer which is widely used to kill different harmful mosquito in different places. The offered killer is manufactured by utilizing superior quality components and ultra-modern technology by our skilled professionals. Moreover, this killer is highly praised for its sturdiness and less power consumption. Looking for Mosquito Killing Equipments ?